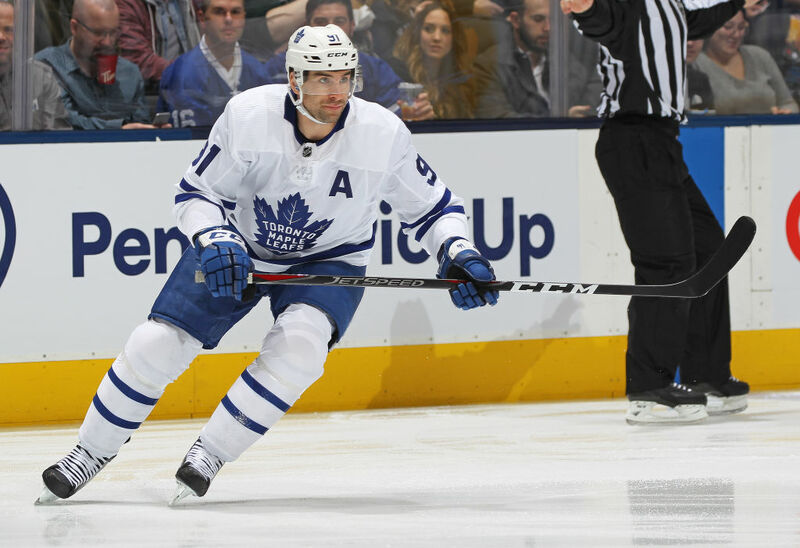 John Tavares has 40 goals in his first season with the Leafs (Getty Images). There was real live noise in KeyBank Center Sunday when you couldn't have expected it. Fans responded to the Buffalo Sabres' physical play and their 4-3 shootout win over the St. Louis Blues. We know there will be noise tonight when the Toronto Maple Leafs – and their legion of fans – hit town. But the Sabres want to find the same kind of style to help them get through a matchup against their archrivals. Faceoff is shortly after 7 and the game is on MSG and WGR Radio. "I just liked the way we competed," coach Phil Housley said today when asked about the St. Louis game. "Everybody competes differently, whether it’s a puck battle or finishing a hit, but everybody is counted on to do their part and that’s going to be important the rest of these games. The physicality and the emotion of the game, I think the guys really enjoyed it and the fans really enjoyed it." Housley has to be hoping for more of the same tonight. The Sabres are keeping the same lineup, which means Carter Hutton in goal with Jason Pominville, Scott Wilson and Matt Hunwick as healthy scratches. Neither team had much of a morning skate today, with the Sabres having optional workouts and the Leafs having meetings in the arena after their late-night arrival from Nashville. 1. What's at stake: The Sabres are trying for their first two-game winning streak since Dec. 11-13, are trying to snap a four-game losing streak against Toronto and will be looking to avoid going winless in a season series against the Leafs for the first time since 1987. The Leafs are looking to win three straight in Buffalo for the first time since 1972. In addition, it will be the second career meeting of brothers Alex and William Nylander. "Well, we'll find out who the best Nylander is in a hurry, right?" Leafs coach Mike Babcock said today. "There's got to be some family bragging rights I would think. It's got to be exciting for both of them, for the family." 2. Leafs in Crisis I: Toronto has lost four out of five games for the second time this year after Tuesday's 3-0 loss in Nashville, and this is its sixth game in 10 days. The Leafs are trying to avoid losing three straight in regulation for the first time this season. "I liked everything except we didn't score," Babcock said. "I thought we were good, the best we've been in a long time. Had every opportunity but in the end we didn't score. I like how we played, how little we gave up. Fewest scoring chances in a long, long time and that's important." Toronto's defense has been a huge problem, giving up 26 goals in the five games (5.2 per game). They couldn't even keep the puck of their net in the lone win over that stretch, Friday's 7-6 victory over Philadelphia. 3. Leafs in Crisis II: A lot of attention will be paid to the Toronto goal, where backup Garrett Sparks is expected to get the call tonight after Frederik Andersen played in Nashville. Sparks hasn't been good this year (7-7-1, 3.24/.902), which is a problem because GM Kyle Dubas kept him and allowed veteran backup Curtis McElhinney to get claimed on waivers by Carolina. All McElhinney has done for the Hurricanes is go 18-8-2, 2.50/.916 and perhaps help get them to the playoffs for the first time since 2009. Meanwhile, Sparks is under huge pressure to perform, especially since he raised plenty of eyebrows when he called on the team to play with more emotion after Saturday's 6-2 loss in Ottawa. Babcock was frank when asked if Sparks' words put more pressure on him tonight. 4. Scoring leaders: Buffalo captain Jack Eichel (25-47-72) doesn't have a point in his last four games. Jeff Skinner (37-22-59) has one goal in his last 15 games. For Toronto, Mitch Marner has rolled up an 85-point season (24-61) but has no goals in seven games while John Tavares has hit the 40-goal mark and has 79 points in 73 games. Auston Matthews, who missed 14 games with a shoulder injury, has 66 points in 59 games (34-32-66). 5. By the numbers: The Leafs are an NHL-best 33-0-1 when leading after two periods. They were 32-0 when the streak was finally snapped in a 3-2 overtime loss March 6 in Vancouver. The Sabres are 16-2-4 when leading after two. ... The Buffalo power play is 0 for 12 the last six games and has slipped to 18th in the NHL. Meanwhile, Toronto penalty killers are 12 for 12 in the Leafs' last six games and rank 11th on the season. ...The Leafs are third in the NHL with 93 second-period goals and are plus-16. The Sabres, meanwhile, are 29th in second-period goals allowed at 87 and are 30th in differential at minus-24.